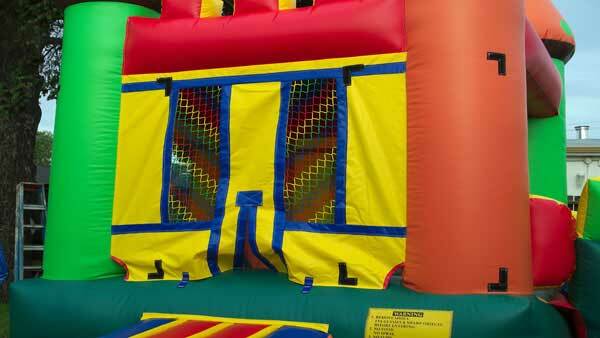 PORT ST. LUCIE, Fla. -- A Florida woman wants to know why someone unplugged a bounce house, causing it to deflate with nearly a dozen young children inside during her daughter's first birthday party. CBS 12 reports two children suffered minor injuries after they were briefly trapped under the heavy plastic during the May 21 party in the backyard of a home in Port St. Lucie, about 114 miles (183 kilometers) north of Miami. The home's surveillance video shows an older man briefly standing at the fence looking at the partygoers before unplugging a cord from an electric outlet on the side of the home as he walked toward the street. Police canvassed the area but couldn't identify the man in the video. The video has been posted online under the heading Bad Neighbor. Five children were hurt near Greenville, South Carolina when a gust of wind made an inflatable bounce house and slide go airborne.